The vast majority of cutaneous squamous cell carcinomas (SCC) have only a limited local impact on the area of involvement. However, some of these SCC’s have an increased risk of recurrence, regional lymphatic metastases, and distant spread. There are several criteria defining high risk SCC's. Tumor size > 2cm has been shown to carry increased risk of regional metastases, as high as 30% in some studies. The size is not the strongest predictor of metastases given other factors. Tumor thickness, however, has been shown to be a strong predictor of both recurrence and regional spread. Tumors ≤ 2mm have negligible risk, while tumors ≥ 5mm have a 12% risk of recurrence and up to 45% risk of lymph node metastases. 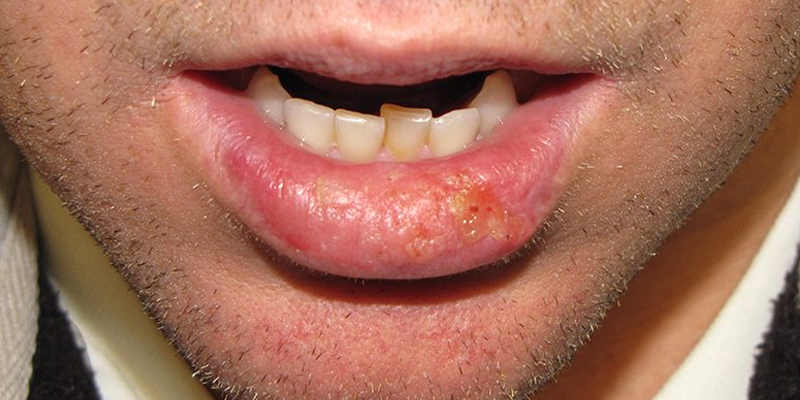 Invasion beyond subcutaneous tissues, for example, into lip muscle or parotid are independent high risk factors. Perineural invasion is present in 5-10% of cutaneous SCC. The size of the involved nerve is a significant predictor of recurrence and death. Involved nerves ≤ 0.1mm in diameter have been shown to have a 9% risk of recurrence. While involved nerves > 0.1mm have a 50% risk of recurrence and 32% risk of death as shown by one study. Another predictor of high risk perineural invasion is neuropathic symptoms of large named nerves. This can be determined even without a biopsy by simply asking the patient. Several other features are associated with high risk behavior – lymphovascular invasion and desmoplastic growth. Infiltrative features specifically has been shown to have up to 23% risk of lymph node metastases and 27% risk of recurrence. More specifically, certain histologic features are ominous – small tumor nests, infiltrative strands, and single cell infiltration. Gross behavioral features such as recurrence or satellite lesions are well known signs of aggressive tumor behavior. One often cited feature of high risk - histologic differentiation - is actually a weak predictor with conflicting evidence on both sides. There are certain histologic types of cutaneous carcinomas that are high risk. Spindle cell carcinomas and adenosquamous cell carcinomas have high risk of regional and distant metastases. Microcystic adnexal carcinomas have a higher risk of recurrence. Host factors must not be overlooked such as chronic lymphocytic leukemia and its immunosuppression. Organ transplant recipients are also well-known victims of aggressive SCC behavior. However, it has been the older immunosuppressants such as cyclosporine causing higher rate of skin cancers. The newer drugs such as sirolimus (Rapamune) cause significantly fewer carcinomas. Understanding what factors to consider in identifying high risk SCC of the face is the first step. Identifying those factors prior to treatment is the critical. That will be covered in upcoming articles.